If you are a chart whore like Panderbear, do yourself a favor and visit VoteView.com. Following up on studies of political polarization, Panderbear discovered the two following charts, among many others, on that website under the heading "Political Polarization." 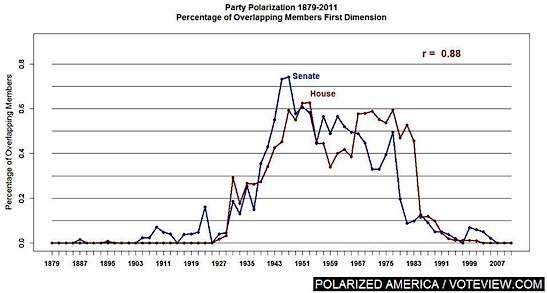 Both charts give information regarding the polarization of members of Congress. The first chart illustrates that you have to go back well over a hundred years to find a period of sustained ideological polarization of the two parties in both Senate and House that matches what we have observed in past several years. Unlike most of the 20th century the current percentage of overlapping members is zero. Most people, including Panderbear, have become frustrated with the lack of compromise and productivity of recent Congresses. Many people have thrown up their hands in an anti-incumbent rage and said we should throw out all the bums. But are the two parties equally culpable for the current era of Congressional gridlock? The second chart makes it clear who the real culprits for this political polarization are. While Democrats currently exhibit approximately the same degree of liberal orientation that they did at the end of the 19th century, Republicans, in a trend that started around 1980 have become increasingly extreme in their conservative orientation. Indeed, Republicans are breaking entirely new ground with regard to partisan conservative policies. It is Republican radicalization that has paralyzed our government and is harming our country.